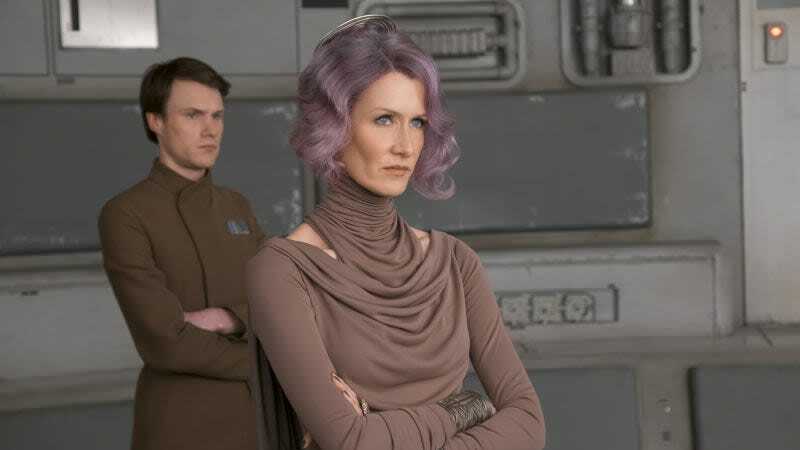 By all accounts, actress Laura Dern is a goddamn professional, weathering questions and franchise-powered obsession from such diverse fandoms as Jurassic Park, Star Wars, and Twin Peaks with unwavering grace and charm. But even legendary resolve can only go so far, which is why we’re delighted, but not surprised, to pick up this anecdote from The Last Jedi director Rian Johnson, who apparently notes on the commentary track for the film’s home release that Dern wouldn’t stop saying “pew” when she fired her laser gun during the movie. Given that almost everybody involved with modern-day Star Wars films grew up watching the original movies, there’s actually a pretty long tradition of stars messing up takes by applying decades of playground foley expertise to their adult work. Hayden Christensen and Ewan McGregor have both told stories about the first few times they had to perform in the franchise’s celebrated lightsaber fights, and the inevitable “whomm, whomm” sounds they would make, ruining the shot.